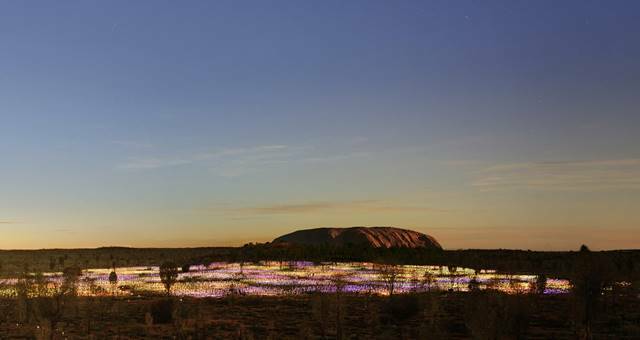 Bruce Munro’s immersive installation, opening to the public on 1 April at Ayers Rock Resort, has gone live. 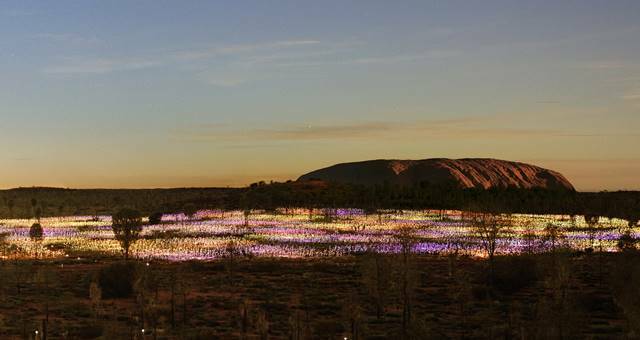 Made up of over 50,000 stems crowned with frosted-glass spheres and covering an area the size of four football fields, Field of Light Uluru was inspired by the way Munro felt when he first visited Uluru back in 1992. He says, quite simply, that the artwork represents joy. The solar powered spheres, connected via illuminated optical fibre, light up as darkness falls and as the sun rises. Munro is best known for producing complex, large-scale, light-based installations. Munro’s subject matter is his own experience of fleeting moments of rapport with the world and existence in its largest sense, of being part of life’s essential pattern. His reoccurring motif is the use of light on an environmental scale in order to create an emotional response for the viewer. 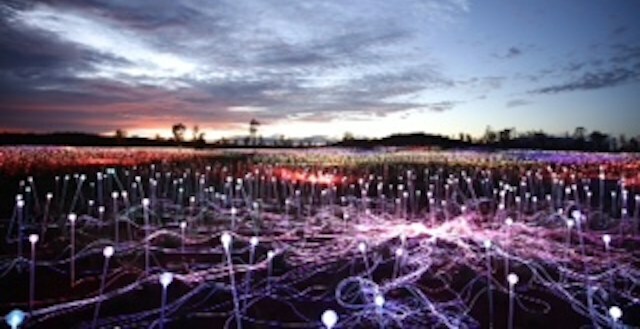 Munro said, “Field of Light was one idea that landed in my sketchbook and kept on nagging at me to be done. I saw in my mind a landscape of illuminated stems that, like the dormant seed in a dry desert, quietly wait until darkness falls, under a blazing blanket of southern stars, to bloom with gentle rhythms of light. 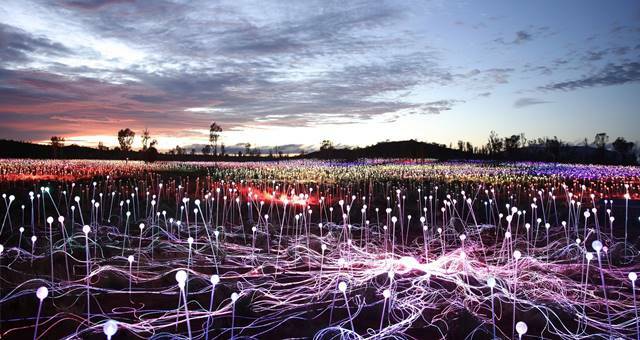 “Field of Light is a personal symbol for the good things in life. “I now have the honour and privilege of returning to create an iteration of this artwork for the place that inspired it. A work conceived in the red desert returns to its birthplace springing from the dry ground,” said Munro. 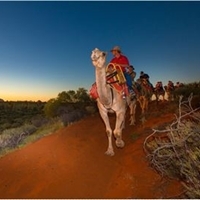 Guests to Ayers Rock Resort can experience the installation in a number of ways, with options including a two hour visit, a Night at Field of Light dining experience and the option to enjoy at Sunrise as the lights fade into the morning light. 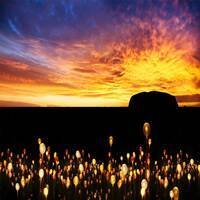 The exhibition, aptly named Tili Wiru Tjuta Nyakutjaku or ‘looking at lots of beautiful lights’ in local Pitjantjatjara, will be in place for a full year throughout the desert’s distinct seasons, and will close on 31 March 2017. 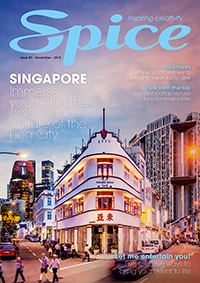 Corporate bookers are encouraged to secure dates at the evening and sunrise dining options as the places are selling fast to leisure travellers and tour groups.